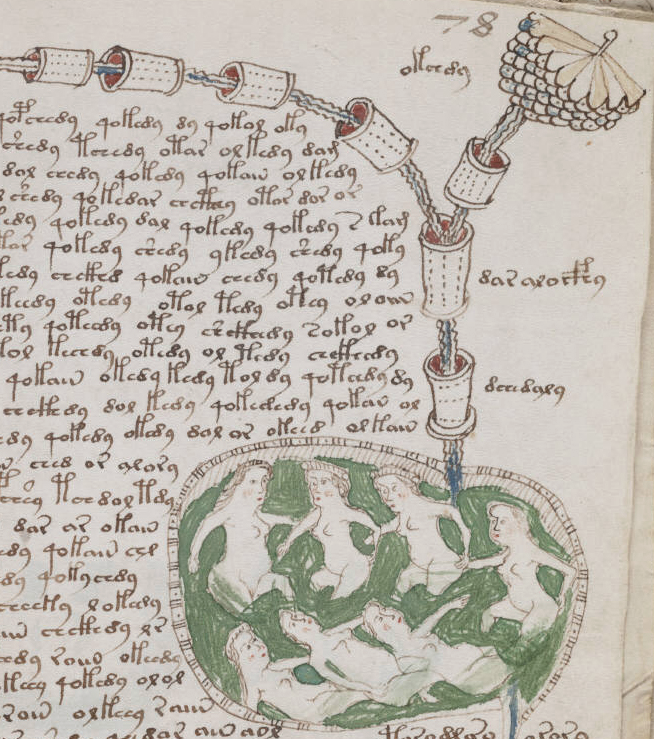 We may never know the truth about the Voynich manuscript, but I’m not sure that bothers me much. Some mysteries are made to be savored. I only regret that our story does not include Theo’s explanation of the naked ladies. Passing strange: Renaissance ladies bathing in the bizarre techno-anatomical environment of the Voynich manuscript. Source: Voynich Gallery. It was the the beginning of July, exactly a month and a week after she had first met West at the symposium. Lynn was in her office seeing a series of students who had complaints about their instructors. Carole always stacked them up like this on Friday afternoons. Most were the usual gradehounds who chafed at any impediment to an easy A, but one was different, a young man who seemed emotionally disturbed. His name was Geoffrey Ricketts, and he was short but muscular, with carrot-colored curls on his head, and dark blue eyes. Right now, the eyes were glaring at Lynn. His instructor, Joanne Davis, was a part-timer who taught Freshman Composition. Joanne had warned her about Geoffrey, saying that he wrote angry, creepy things in his journal about what he would like to do to his girlfriend. Lynn had already notified the campus “Care Team,” a committee who dealt with cases like this, but they had determined that Ricketts was not over the line yet. Unfortunately, he was failing the class, and he blamed Joanne. “I understand that you feel frustrated right now,” said Lynn patiently, “but it is far past the point in the summer term when we can move students around in the sections. The registrar won’t permit that.” Her phone rang; she was expecting news from the college on whether a new hire was approved. “I’m across from Chester Hall.” She was surprised and flustered, but pleased at the idea of seeing him. “I’m in a meeting, but I should be finished soon.” Her eyes were on Ricketts, who looked increasingly agitated. “Come on by.” She hung up. “But I’m failing the class! I can’t fail. I’ll lose my financial aid,” he said, his voice rising, as though he was about to burst into tears. “Dr. Davis can help you if you’ll let her. But I’m afraid that if you do fail, there’s nothing I can do to change that outcome.” Ricketts got up and gathered his things, his face working, and she stood up to see him out the door. Suddenly he bent over, picked up her metal trash can, and hurled it at the clock on the wall in the outer office, shattering its glass face. He turned to rush away, and barreled right into Carole, who was emerging from the filing room. He pushed her roughly to the ground. “Carole!” cried Lynn, moving to help her up. Meanwhile Ricketts ran past her down the hallway toward the reception suite, only to be confronted by West, who was striding purposefully down the hall in a charcoal suit and navy tie, his bulk filling the narrow space. As Ricketts tried to brush past him, West unhesitatingly grabbed him by the back collar of his polo shirt, lifting him so that his heels lost contact with the floor. Ricketts spat out a stream of obscenities as he struggled to get free, and West looked over at Lynn and Carole with a shrug, holding his thrashing antagonist by the back of his shirt, which was now completely untucked, and the back waistband of his jeans. At the other end of the hallway, a small crowd had gathered to watch the proceedings. “You can let him go,” said Lynn. “Geoffrey, I’m going to call the police now. You should go home and meet them there. Don’t make them look for you.” West released the young man and he jerked violently away, then ran down the hall past the onlookers. Lynn was already dialing the campus police as West went over to Carole, who was rubbing her forearm gingerly and wincing. “Let me see that,” he said and she obediently extended the arm. He held it gently, palpating and probing. “It’s already swelling, but I don’t think it’s broken. Still, you’ll need X-rays.” Lynn reported this to the dispatcher, who promised that the police would transport Carole to an urgent care center. The small crowd was now streaming into their end of the suite, exclaiming over the broken glass and murmuring in sympathy with Carole. “You mean like the lives of librarians?” she asked, giving him a meaningful look. “I have something for you,” he said, and pulled from his pocket her chain, with the golden key still suspended from it. “I wondered what you did with that,” she said, feeling a sense of peace and serenity as he clasped it around her neck. Everything is going to be all right. He took the key and dropped it down the front of her blouse. “Now it’s back where it belongs. Lynn, I don’t want to stop seeing you. I’m falling in love with you. Are you willing to put up with me?” He held both her hands tightly in his. Notes: The episode of young Mr. Ricketts is adapted from a true story. Sometimes I think about how that day might have been different if “Ricketts” had possessed a handgun. Thank goodness, he did not. The information I have presented about the Voynich Manuscript accurately reflects current knowledge of its date and nature. It is missing several pages, which were probably separated from the document before Voynich’s discovery in 1912; the whereabouts of these pages are unknown. Over already? 😦 West is a man of infinite resources, that’s for sure. Fortunately none of the Ricketts, real or fictional, had a gun. Congrats, Linnet, great job. And, by the way, a couple of weeks ago I saw in the NG channel a documentary about the Voynich 😀 Just the end, though. The scholars (obviously not as good looking as Mr. West) identified the author as a certain Italian chemist and identified certain strange tubes as the ones present in Milan’s Castello Sforzesco. Ack, that was a true story? How scary. I’m glad he didn’t have a gun too. Geez, that could have been a nightmare. Best not to think about that, though. Yes, there was no West in the story, but two gentleman colleagues of mine went after him. He eluded them and was picked up at his dorm by the police. I hope never to experience another incident like that! I guess it illustrates how we weave real life into our fiction…. I loved this series, and am sad to see it end! Thank you so much 🙂 My series-reading audience is not large, so I treasure each one of you! A satisfying ending LM, despite the irate student. Love how West didn’t stick around for the coppers! Ahhh, I love a happy ending. That must have been incredibly unsettling for you to have a student ‘do his nut’ like that. Glad it ended OK and that he didn’t have a weapon. My Dad has been a uni lecturer for a tad over ten years but the worst he has got is some tears and a lot of ‘my grandma died and I didn’t finish my paper’. Thanks Cheer! You have been a faithful reader! Of course I get the dead grandmothers too. Paper deadlines are absolutely lethal for them! And I have never understood why grandpapas do not suffer the same high rates of extinction. Hubby gets this sort of thing all the time. Worst was the student whose family would lose the farm if he didn’t pass. Turns out it was true… he’d been hired with a contingency that he graduate, promised a sign-on bonus, and was planning to use that to prevent the family farm from being repossessed… the dad showed up to plead with Hubby as well. Such a tough situation, but it was really up to the student to study hard and make sure he graduated, not Hubby’s responsibility. He’s always made it clear, no exceptions. The opportunity for extra credit was early on, not after final exams were over. Oh yes, that is a very tough situation. Sometimes I have people whose financial aid depends on the grade. But why do they not take that into account during the semester, instead of at the end? I keep a box of tissues in the office for those moments. Loved it 🙂 saved it yesterday to read before going to bed 🙂 What a scary incident though and even more so because it happened in real life too… teaching is never and easy job..
Do you know that press article? Fascinating–yet another theory! Thanks for the link!